Comments: This is the first kit I purchased and I use it to this day. The Sennheiser wireless units are pretty standard across the industry. Remember – you need one set PER actor… and if you get two sets make sure you get them on different frequencies – Sennheiser sells them as separate packages for that reason. 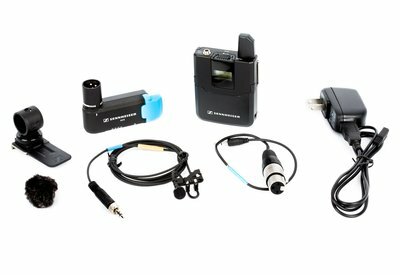 Description (from Sennheiser): This ENG set offers a great amount of flexibility for portable recording indoors or outdoors. Its SKP 100 G3 plug-on transmitter transforms XLR equipped devices (such as microphones and mixing consoles) into wireless devices by simply plugging the unit in. The bodypack transmitter, as well as the plug on, can be synced up to the receiver with the simple push of a button. A very small high-quality omni-directional clip-on microphone completes this set. Comments: This is Rode’s answer to Sennheiser’s G3 and Shure’s FP wireless Lav system. The RodeLink Wireless system includes a Rode Lav Mic, Wireless Transmitter, Wireless Receiver, and 3.5mm-3.5mm Audio Cable. The kit is capable of providing 24-bit 44.1 kHz lossless audio at a distance of up to 300 feet! The system constantly changes frequencies to obtain the strongest signal with the least interference. A unique one-touch operation automatically scans and pairs the transmitter and receiver over 8 different channels with 8000 combinations. The pair can be powered directly by 2x AA batteries each or by micro USB cables. You can plug the receiver directly into your DSLR Mic input or into an external digital audio recorder using the included 1/8″-1/8″ audio cable. If your recorder of choice requires XLR, check out our 1/8″ to XLR adapters. Description: This is Rode’s answer to Sennheiser’s G3 and Shure’s FP wireless Lav system. 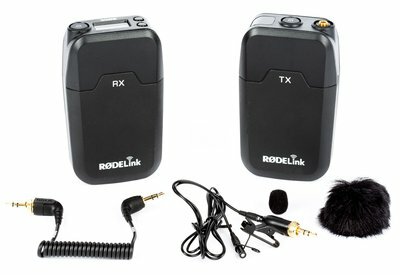 The RodeLink Wireless system includes a Rode Lav Mic, Wireless Transmitter, Wireless Receiver, and 3.5mm-3.5mm Audio Cable. 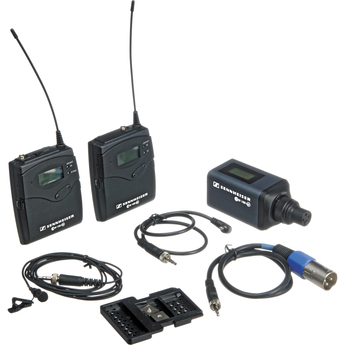 The kit is capable of providing 24-bit 44.1 kHz lossless audio at a distance of up to 300 feet! The system constantly changes frequencies to obtain the strongest signal with the least interference. A unique one-touch operation automatically scans and pairs the transmitter and receiver over 8 different channels with 8000 combinations. The pair can be powered directly by 2x AA batteries each or by micro USB cables. You can plug the receiver directly into your DSLR Mic input or into an external digital audio recorder using the included 1/8″-1/8″ audio cable. If your recorder of choice requires XLR, check out our 1/8″ to XLR adapters. Comments: The Sennheiser AVX MKE2 Wireless Lav Microphone Kit is a remarkable lav mic set designed to work reliably and easily. The system constantly changes frequencies to achieve the cleanest, strongest signal possible, all with zero input from the user. A neat Auto Dynamic Range setting automatically adjusts audio levels to the recording device’s input sensitivity, reducing the need to change levels and also reduces distortion. Say goodbye to AA batteries as well, the transmitter and receiver are powered by a built-in Li-Ion battery charged through the included Micro USB cable and wall plug. The transmitter will last about 15 hours and the receiver will last about 4 hours on a single charge. The receiver is also able to receive 48V power from your recording device (if applicable) and switches between phantom and battery power automatically. Description: The Sennheiser AVX MKE2 Wireless Lav Microphone Kit is a remarkable lav mic set designed to work reliably and easily. The system constantly changes frequencies to achieve the cleanest, strongest signal possible, all with zero input from the user. A neat Auto Dynamic Range setting automatically adjusts audio levels to the recording device’s input sensitivity, reducing the need to change levels and also reduces distortion. Say goodbye to AA batteries as well, the transmitter and receiver are powered by a built-in Li-Ion battery charged through the included Micro USB cable and wall plug. The transmitter will last about 15 hours and the receiver will last about 4 hours on a single charge. The receiver is also able to receive 48V power from your recording device (if applicable) and switches between phantom and battery power automatically. Comments: This is a great starting off point and the easiest solution for most. 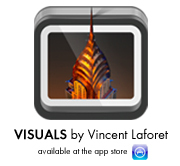 Plug this into your HDSLR and “voila!” you have sound. The limitation is that you always want to have your microphone as close as possible to your subject as possible… NOT on your camera where you can hear the operator and every other unwanted sound. 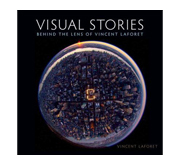 Needless to say: this is still WORLDS better than the built-in microphone on your DSLR. 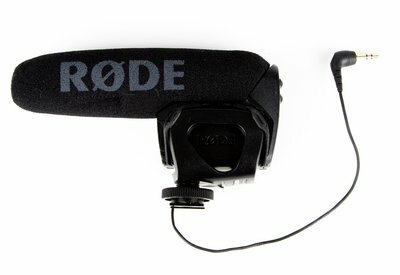 Description (from Rode): The RØDE VideoMic is a professional grade 1/2″ condenser shotgun microphone designed for use with consumer video cameras and personal audio recorders. The integrated shock mounting system isolates the VideoMic capsule and electronics from its all-metal shoe mount, providing isolation from external physical factors that may cause unwanted rumble and vibrations in the microphone. Comments: The Sennheiser MKE 400 on-camera shotgun microphone is a high-quality, compact alternative to using the built-in microphones on DSLR cameras. Offering an all-metal housing, maximum side noise rejection, switchable sensitivity, integrated shockmount, and foam windshield, this little microphone is one of the most versatile on-camera solutions out there. 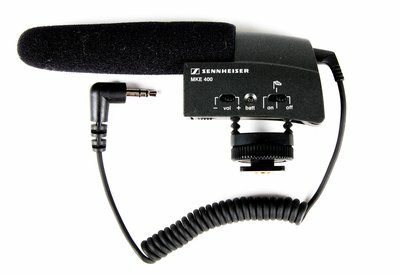 Description: The Sennheiser MKE 400 on-camera shotgun microphone is a high-quality, compact alternative to using the built-in microphones on DSLR cameras. Offering an all-metal housing, maximum side noise rejection, switchable sensitivity, integrated shockmount, and foam windshield, this little microphone is one of the most versatile on-camera solutions out there. Comments: Rode’s funky looking stereo mic features a pair of 1/2″ condenser capsules (each with cardioid polar patterns) in a stacked X-Y configuration. 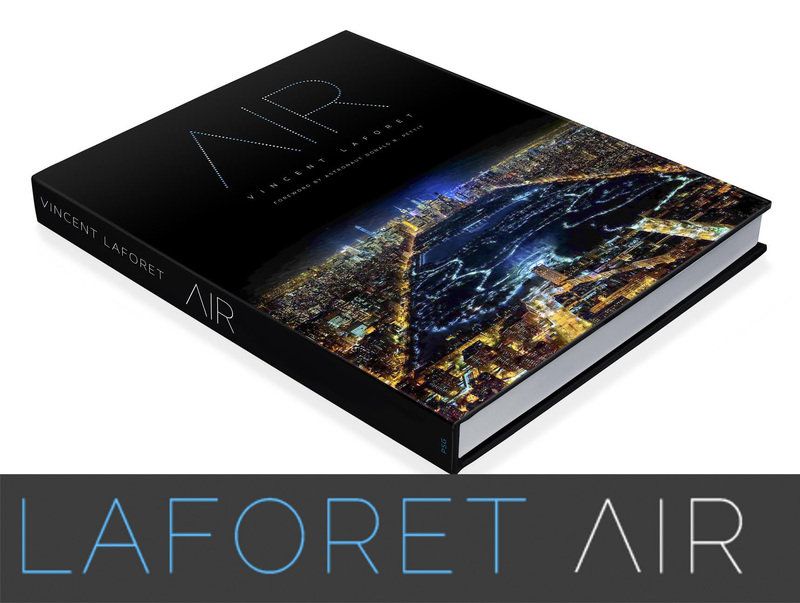 This gives you amazing, true-to-life, stereo audio from right on top of your camera. Use it to record ambient sounds, interviews, anything really. The VideoMic X is either run off an on-board 9V battery or by 48V phantom power. It features an included 1/8″ (3.5mm) to 1/8″ stereo cable. It also has dual balanced Mini-XLR (TA3F) output jacks. On the back of the unit, you can easily switch a three-step high pass filter (0, 75Hz, 150Hz), a three-position level control (-10dB, 0dB, +20dB), and a high frequency boost (+6dB). The high frequency boost is perfect for giving speech a significant boost to you your recording. Our unit includes a 1/8″ (3.5mm) to 1/8″ stereo cable, 2x Mini-XLR (TA3F) to Male XLR cables, pop shield, and a wind shield (dead cat). 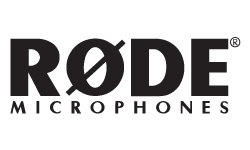 Description: Rode’s funky looking stereo mic features a pair of 1/2″ condenser capsules (each with cardioid polar patterns) in a stacked X-Y configuration. This gives you amazing, true-to-life, stereo audio from right on top of your camera. Use it to record ambient sounds, interviews, anything really. The VideoMic X is either run off an on-board 9V battery or by 48V phantom power. It features an included 1/8″ (3.5mm) to 1/8″ stereo cable. It also has dual balanced Mini-XLR (TA3F) output jacks. On the back of the unit, you can easily switch a three-step high pass filter (0, 75Hz, 150Hz), a three-position level control (-10dB, 0dB, +20dB), and a high frequency boost (+6dB). The high frequency boost is perfect for giving speech a significant boost to you your recording. Our unit includes a 1/8″ (3.5mm) to 1/8″ stereo cable, 2x Mini-XLR (TA3F) to Male XLR cables, pop shield, and a wind shield (dead cat). Comments: The Rode NTG4 Shotgun Microphone is a super-cardioid directional shotgun mic designed to give outstanding audio quality at an affordable price. 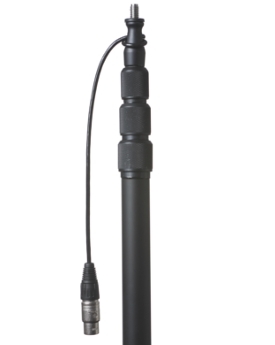 This mic has a frequency response of 20 to 20,000 Hz, a sensitivity of -32dB, and a low signal to noise ratio of 78dB SPL. The NTG4 requires phantom power through the XLR. The first button on the mic gives a -10dB pad to reduce clipping on loud bursts. The middle button enables a 75 Hz high pass filter, effective at reducing low frequency rumbles. The last button is a high frequency boost, good at restoring some of the high sounds lost when placed in a blimp or dead cat. Description: The Rode NTG4 Shotgun Microphone is a super-cardioid directional shotgun mic designed to give outstanding audio quality at an affordable price. This mic has a frequency response of 20 to 20,000 Hz, a sensitivity of -32dB, and a low signal to noise ratio of 78dB SPL. The NTG4 requires phantom power through the XLR. The first button on the mic gives a -10dB pad to reduce clipping on loud bursts. The middle button enables a 75 Hz high pass filter, effective at reducing low frequency rumbles. The last button is a high frequency boost, good at restoring some of the high sounds lost when placed in a blimp or dead cat. Comments: The Rode NTG4+ Shotgun Microphone is a super-cardioid directional shotgun mic designed to give outstanding audio quality at an affordable price. This mic has a frequency response of 20 to 20,000 Hz, a sensitivity of -32dB, and a low signal to noise ratio of 78dB SPL. The NTG4+ has an internal rechargeable Li-Ion battery that can last 120 hours on a single charge! The first button on the mic gives a -10dB pad to reduce clipping on loud bursts. The middle button enables a 75 Hz high pass filter, effective at reducing low frequency rumbles. The last button is a high frequency boost, good at restoring some of the high sounds lost when placed in a blimp or dead cat. Description: The Rode NTG4+ Shotgun Microphone is a super-cardioid directional shotgun mic designed to give outstanding audio quality at an affordable price. This mic has a frequency response of 20 to 20,000 Hz, a sensitivity of -32dB, and a low signal to noise ratio of 78dB SPL. The NTG4+ has an internal rechargeable Li-Ion battery that can last 120 hours on a single charge! The first button on the mic gives a -10dB pad to reduce clipping on loud bursts. The middle button enables a 75 Hz high pass filter, effective at reducing low frequency rumbles. The last button is a high frequency boost, good at restoring some of the high sounds lost when placed in a blimp or dead cat. Comments: A must have part of any audio kit. 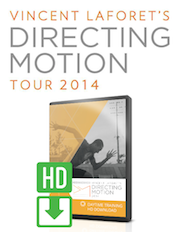 This is a great starting off point for your audio kit. Description (from K-Tek): Crafted in cost-effective aluminum tubing, Avalon boom poles are designed to meet the needs of ENG and DV Camera crews. The series offers many of the same benefits of the original Klassic boom poles in an affordable package — eliminating some deluxe features but without sacrificing any of the K-Tek quality. 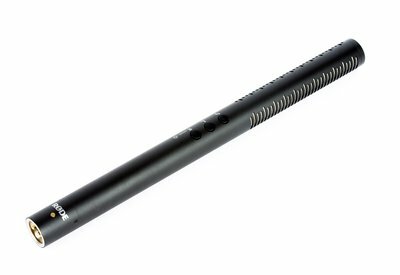 For a discount of the mic Go to www.3dmicpro.com and use coupon code VL3D0012 during checkout. Comments: This is an extremely effective and interesting microphone – especially for time lapse / scenic videos where you want to immerse people in the environment. 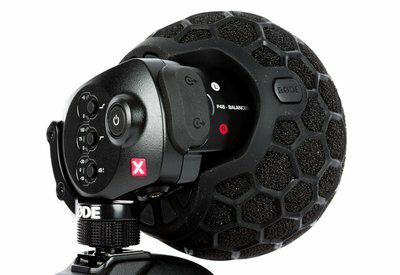 Description (from Mitra): Mitra Corp. designed 3D Mic Pro, an immersive sound imaging microphone which uses patent pending technology to capture breathtaking binaural like immersive sound in any sound recorder or video camera equipped with Mic/Line/XLR socket. The recorded immersive sound can be played back in any audio video system through a pair of closely placed speakers or by headphones or ear-buds. 3D Mic Pro brings the immersive 3D sound in handheld devices such as MP3 players, Smartphones, Tablets. For the very first time 3D Mic Pro makes professional quality 3D sound production practical and affordable for musicians, videographers, sound engineers, naturalists, Radio Jockeys and hobbyists. Anyone can now record professional quality immersive sound in YouTube videos, professional or home videos, indi film productions, garage band demo CDs, nature sound recordings or stereo radio broadcasts. Possibilities are only limited by imagination. Comments: This is the Indie version of the 3D Mic. It contains only 1 Mic level phono output, and not the two XLR outputs. Description (from Mitra):3D Mic Indie is designed to offer exceptional value and affordability for any DSLR filmmakers. It has exact same immersive sound engine as 3D Mic Pro, so it will capture same breathtaking true-to-life immersive sound in a DSLR or a sound recorder. The only way it differs from the big brother 3D Mic Pro is in its audio connectivity. 3D Mic Indie offers only phono socket to connect it with any DSLR, video camera or audio recorder. The recorded immersive sound can be played back in any audio video system through a pair of closely placed speakers or by headphones or ear-buds. 3D Mic Indie brings the immersive 3D sound in handheld devices such as MP3 players, Smartphones, Tablets. 3D Mic Indie makes professional quality 3D sound production practical and affordable for musicians, videographers, sound engineers, naturalists, Radio Jockeys and hobbyists. Anyone can now record professional quality immersive sound in YouTube videos, professional or home videos, indi film productions, garage band demo CDs, nature sound recordings or stereo radio broadcasts. Possibilities are only limited by imagination. Comments: A nice "cheaper" and easy compact solution for using your iOS device and still getting really good audio for interviews for example. 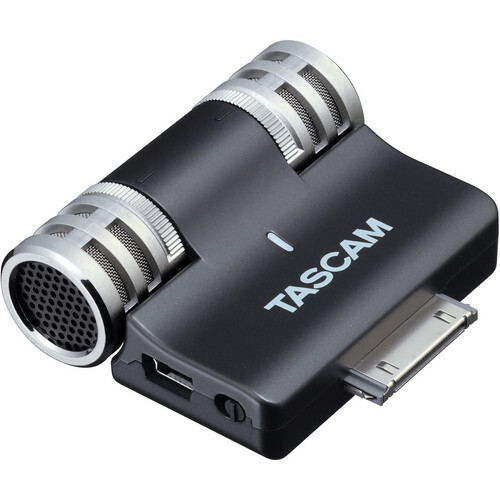 Description: TASCAM’s iM2 turns the iPhone, iPad or iPod touch into a high-quality stereo recorder. A pair of condenser microphones – the same high quality as TASCAM’s best-selling DR-series recorders – plugs into the dock connector of your Apple device. The microphones are adjustable over 180 degrees for the best sound placement. The uni-directional elements are arranged in an AB pattern for detailed stereo imaging while capturing the ambience of your room. The iM2 contains its own microphone preamp and analog-to-digital converter for low noise and great audio quality. Unlike mics that use the built-in iPhone preamp, the iM2 can handle up to 125dB sound levels to capture the loudest concerts and instruments without distortion.